Sign up for Broadjam today to follow Nathan Corsi, and be notified when they upload new stuff or update their news! 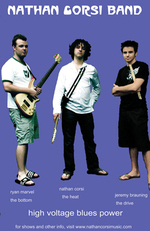 These recordings were made with Nathan Corsi's trio. The Album is entirely live, and was multitracked on a digital 8-track recording console. The stellar performances of Nathan Corsi (guitar), Jeremy Brauning (drums), and Ryan Marvel (bass), make this home recorded album Nathan's most energetic and rocking to date.